New clients often remark how “homey” our Tustin office is. That’s good, because our goal is to offer holistic wellness care in a comfortable family surrounding. You’ll be warmly welcomed and made to feel at home. 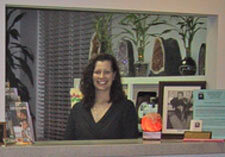 Upon entering The Intention Wellness Center you’ll be welcomed by Danielle’s patented smile. She will hand you a clipboard with our paperwork attached. Please make yourself at home while you are filling out the paperwork (it will take about 5 minutes). You can relax on our couch or one of the chairs that are available. Also, please help yourself to water, hot herbal tea, raw almonds, fresh fruit or anything else we have put out for your enjoyment. Once the paperwork is completed, Danielle will invite you back to one of two adjustment rooms. Please get comfortable either sitting on the adjusting table or the chair in the corner of the room. After reviewing your paperwork, Dr. Jay Weber, D.C. will enter and introduce himself. He will ask you to discuss your current level of health, what your goals are, and he will answer any questions you might have. Next you will experience the easiest, most gentle physical exam that you have ever had. You simply lie on the table, fully clothed, and relax. Dr. Weber, D.C. will perform a holistic analysis of your entire body. This unique analysis will determine any imbalances that you might be experiencing. Once the exam is complete, you will sit back up and the doctor will explain all of his findings, make the appropriate recommendations and answer any questions that you may have. Together, you and Dr. Weber, D.C. will determine if this office is the right choice for you. If yes, then you can decide to experience your first adjustment at this time. After the gentle adjustment (no cracking or popping), the doctor will give you any homework instructions, answer any of your questions and then walk you back up to the front counter. Danielle will then handle payment and scheduling your next visit. Congratulations! You just took the first step towards a new and improved you! Easy wasn’t it? Total time needed for the first visit is about 45 minutes to an hour.